Business Plan A And Plan B PowerPoint Templates And PowerPoint Themes 1012-Use this PowerPoint Template to illustrate the advantages and disadvantages of two Business Plans that are Plan A and Plan B. It also consists of person demonstrating the concepts of both the plans. 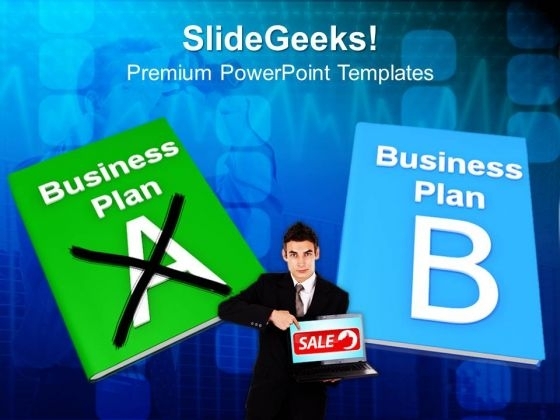 This Template will fit for Business, Marketing and Sales Presentations.-Business Plan A And Plan B PowerPoint Templates And PowerPoint Themes 1012-This PowerPoint template can be used for presentations relating to-"Plan a and plan b, business, signs, success, marketing, education" In the market,customer is king. Anoint him with our Business Plan A And Plan B PowerPoint Templates And PowerPoint Themes 1012. Your thoughts andour Business Plan A And Plan B PowerPoint Templates And PowerPoint Themes 1012 are destined to amalgamate. They will create a champion team.